You’ve probably seen them all over – in restaurants, modern homes, and on the Web. Terrariums, those “gardens under glass,” seem to be the rage right now and this Victoria Era trend is back in the cool corner. 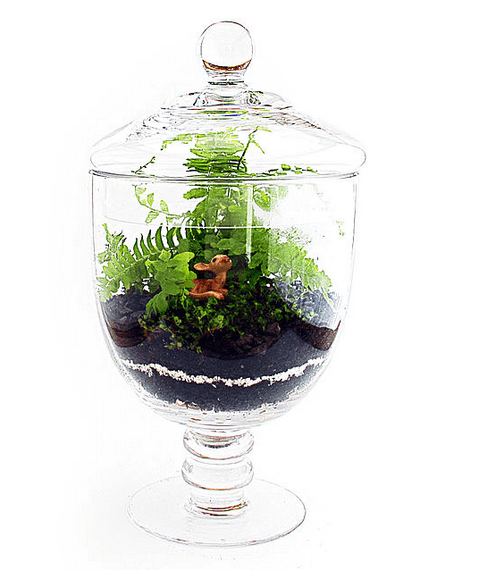 Pretty and natural, terrariums spruce up spaces beautifully and are quite simple to create. Here’s how to build a terrarium step by step. Because terrariums produce their own self-contained environment, light needs to pass through whatever container you choose so the plants inside can grow. Glass jars work well, but you can pick vases, and we’ve even seen lightbulbs used as containers. Before you choose your container however, decide what plants you want to house in it. Your answer will determine how big the container should be and if you can leave it open or closed. An open terrarium doesn’t have a glass cover, and a closed one does. Open terrariums are best for sun-loving plants, and high-humidity-preferring plants do best in closed terrariums. Also, be sure that the container’s opening is large enough to allow you to insert soil, plants, and other terrarium features such as figurines, rocks and twigs. First, clean your container thoroughly and allow it to dry completely. This is to discourage bacteria growth that could impact your terrarium plants. You’ll also need to allow for drainage in your container. Add up to four inches of drainage material like crushed gravel to the bottom of your container. The depth of gravel you choose depends on the size of your container and the amount and type of plants you include inside it. Add a thin layer of activated charcoal on top of the drainage material to keep the terrarium bacteria-, fungi- and odor-free. Add fresh moss (sheet or fern moss) if you llke the look of it. Add soil. Choose the right soil type for the terrarium plants you’ve chosen (potting soil is one option, and sand is another for if you use, say cacti in your container). Put enough soul in the terrarium to completely cover the root ball of plants you pick. Fill Your Container with Plants, Etc. Nearly any house plant will work in a terrarium, but it’s best to choose those that are slow-growing, small and hearty. It’s recommended that you use plants that are compatible and require similar amounts of soil and water because they will be growing so closely together. For instance, keep tropical plants tougher and same with succulents and cacti. It’s also important to keep in mind that traditional, closed terrariums are usually moist, humid habitats, so plants to succeed in that kind of ecosystem are the best. When you’re ready, take the plant out of its pot and break up the soil ball to access the roots/ Dig a hole in the terrarium soil and add some soil to the base of the plant. Aim for a soil depth a little higher than the height of the plant’s pot. Inspect and clean the plants first. Check for insects or diseased areas, and then prune and remove dead areas. Place the largest plants first and then populate your terrarium with the other, smaller plants. Add plants of varying heights and colors for visual interest and fill in spaces with moss, rocks (pumice is nice) and glass beads, tiny sculptures, etc. 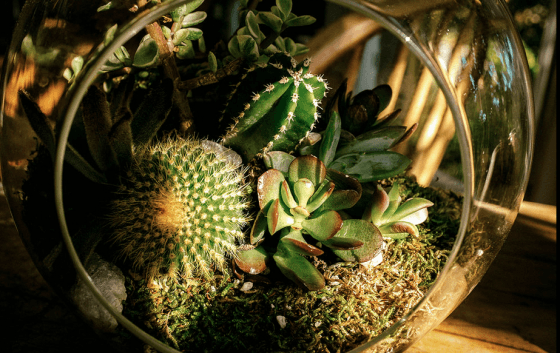 Cacti and succulents are pretty terrarium plants, but don’t do well in closed, humid environments. These plants do best in open terrariums that stay dry. If you do use cacti and succulents in closed terrariums, they will most likely rot within a few weeks due to excessive moisture. In all, there are literally hundreds of plants to can thrive in terrariums depending on the conditions created. Whatever you fancy, be sure to do your research to ensure your terrarium ecosystem is right for your plants. More unique but striking plants such as orchids and air plants can also be contained, as long as you know how to care for them properly in the terrarium. Some people add insects or reptiles to terrariums, but that requires careful consideration of the needs of these living things. Lighting, garden figures and branches can also be included in your terrarium landscape. Aquatic plants in a water terrarium is another popular idea. If you want to go seasonal, consider accents such as pine cones and even ornaments. One particularly cool open terrarium we glimpsed recently included the additional of several small bonsai plants with a manzanita branch towering over top of them. Little ornaments hung from each manzanita stem and were changed out according to the time of year. Closed terrarium plants infrequently need water because the humidity created inside is enough moisture for the plants. However, if you notice that plant leaves are looking brown and faded, add a bit of water to make the top soil layer barely moist. You can also lightly mist the leaves with water. For open terrariums, keep the soil just barely moist and for cacti and succulents, keep the lower soil later slightly damp when needed. Don’t place closed terrariums in direct sunlight as the trapped heat will cause plants to burn and die. Also be sure to keep terrariums away from heat sources such as vents and radiators. Most terrariums do best in filtered sunlight than direct sun. Artificial light also works well. Keep the terrarium container clean and remove moisture and dust from the glass on a regular basis. Use damp newspaper or a lint-free cloth and don’t use cleaning products because they can damage your plants. Get rid of an algae as it pops up – usually as a green coating on the glass. Clean leaves and prune any dead leaves or blossoms to repel fungi growth. Clean out any insects you don’t want and spray affected areas with natural insecticide. Overwatering your terrarium plants will often result in mold growth and decaying leaves and roots. If your terrarium shows a lot of condensation on the glass surfaces, take off the cover of the terrarium for a bit until the condensation clears. One way to prevent overwatering is to know the soil needs of your plants and use a spray bottle to mist leaves and soil instead of pouring the water. Temperatures inside closed terrarium especially can get very high. If you’re noticing browning leaves or faded spots, reduce the amount of light your terrarium gets. Try a shadier spot and see if plants return to normal appearance. If plants look weak or scraggly, make sure that mold or pests aren’t an issue first. If you can remove those factors, the problem might be that your terrarium isn’t receiving enough light. Again, locate your terrarium to another spot that gets more light and see it it makes a difference. Some plants just don’t do well in terrariums, especially closed versions (see: succulents and cacti). Choose plants for the amount of light and humidity they will receive and be sure that plants are scaled to the size of your container. 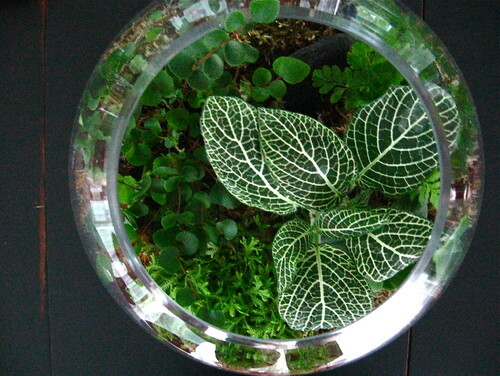 Otherwise, overgrowth and dead plants will ruin the look of your terrarium. Although fertilizing twice a year should be fine, be aware that some plants just don’t need. You don’t need to encourage much new growth with terrarium plants otherwise overcrowding will be a problem, so proceed carefully with the fertilizer. Make sure that it’s necessary to fertilize for general plant health before doing it at all. 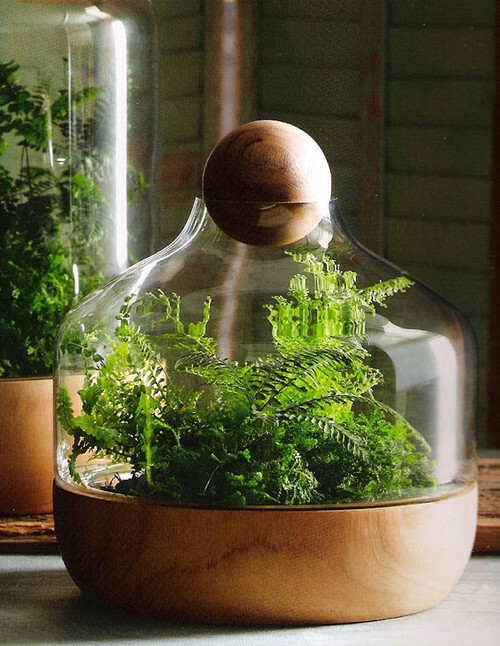 It’s nice to add a little nature to your indoor space with striking terrarium. In addition to being beautiful for decor, terrariums boost the oxygen in your house and are are easy to make and match to any design style. 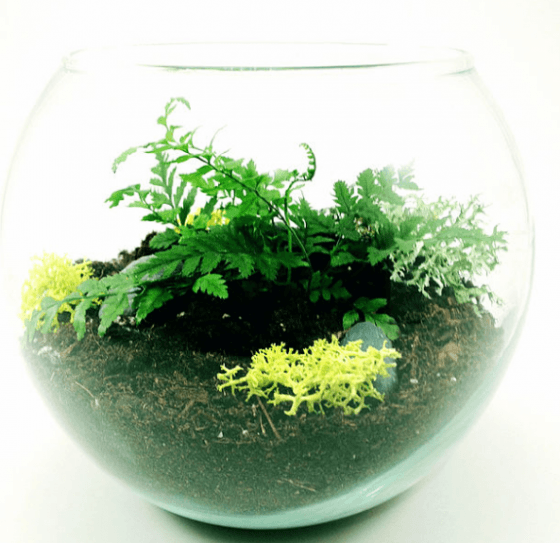 Have you created any terrarium designs you want to share?